Deke Meyers in his book Tying Bass Flies 12 of the Best, listed the Wiggle Bug as an effective bass fly. Admittedly, the fly may be hard to retrieve and picking it off the water to recast takes some effort. Fishing with a large rod using this fly all day can be tiring. 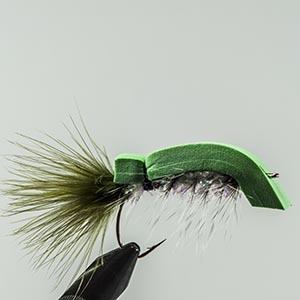 However, a simple modification creates the Wobble Bugger, a fly that is easy to tie and just as effective, if not more so, than the Wiggle bug. To tie the Wobble Bugger, first tie a Wooly Bugger. The Wooly Bugger is found in everyone's fly box. It is the first fly taught to beginning fly tyers. There are thousands of variations. Do not weight the Wooly Bugger and leave about ¼ inch of bare shank behind the eye. Next the wobble is added by tying a foam back over the fly. The Wobble Bugger uses only basic materials. If you tie Wooly Buggers, you already have most of the materials required for this fly. For the foam back, use 6mm foam door hangers found at the local craft store. They come in packages that include several colors and are inexpensive. I cut the strips using a razor blade and a straight edge. Each strip should be about 1/4 inch wide. On larger hooks do not increase the width of the strip too much. If the strip is very large, the fly may land on it's back and not turn over when it is stripped through the water. Surprisingly, it will still catch fish. If you cannot find the door hangers, you can glue three 2mm foam sheets together. These sheets can also be found at the craft store. I use 3M Supper 77 spray adhesive. After the glue dries, cut the foam into strips. Get creative and combine colors for different flies. You can also use colored markers to alter the color and look of your flies. 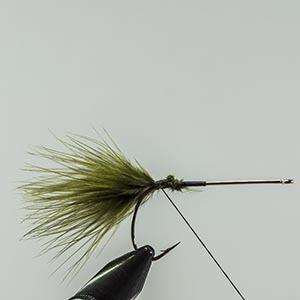 Use 6-0 black thread for tying the Wobble Bugger. However, when you reattach the tying thread at the back of the hook, you might want to use 3-0 thread. This reduces the chance of breaking the thread when you pull hard to bind the rear of the foam strip. Also, reattach the thread just in front of the tie in point to prevent the thread from sliding backwards off the body toward the rear of the hook. This might cause the rear of the foam strip to curve downward and affect the action of the fly. For eyes, you could just paint them on with a marker. However, I like the look of doll eyes. 3mm doll eyes can be found at the craft store and are very inexpensive. Attach them with medium super glue. Fishing the Wobble Bugger is very simple. Cast the fly toward the bank of the river, lake, or around structure. Allow the fly to sit still for a minute, and then strip the fly toward you in short 6-inch strips. Vary the speed and length of the strip and also pause during strips. The fly may land on it's side but as soon as you strip the fly, it rights itself and will dive about 4 inches and wobble back and forth. Strikes generally occur as you start stripping the fly but can occur anytime, even as the fly is sitting still. The strike may be explosive. The fish are not subtle when they take the Wobble Bugger. The Wobble Bugger can be easily cast with a 5-wt rod. Because it does not dive as deep as the Wiggle Bug, it can be picked up off the water and recast easily. I believe that this fly imitates a wounded minnow. Bass will often hit a baitfish to disable it before eating it. Generally, a wounded minnow will not last very long on the surface of the water. Look at the baitfish in the water where you fish. The local Game and Fish Department can often help you identify the baitfish in your area. 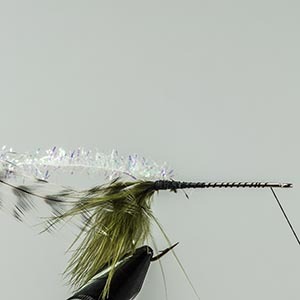 Vary the fly-tying materials to match the color of the baitfish where you live. But red, black and yellow also work well. The Wobble Bugger is easy to tie and does not require any exotic material or special tying procedures. You can easily tie up a couple of dozen for your fly box in an evening. Let me know how this fly works for you. I can be contacted at mike@bugcrafters.com. Step One: Place the hook in the vice and attach the tying thread. Start the thread mid-shank and wrap it to a point opposite the barb of the hook. This is the tie in point. 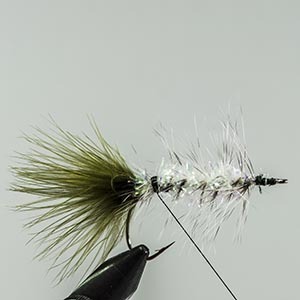 Select a single marabou feather and measure against the hook. The tail should be the length of the shank of the hook. Tie the tail in at the tie in point, and trim the excess marabou. Step Two: Tie in a grizzly hen feather. Tie in by the tip with the shinny side toward you. The fibers of the feather should be about the length of the gape of the hook. Step Three: Select a piece of chenille that is about six inches long. Remove ¼ inch of fuzz from one end of the chenille. This step reduces the bulk at the tie in point. Tie the chenille in by the two exposed threads. Advance the tying thread to a point about ¼ inch behind the eye of the hook. Step Four: Wrap the chenille forward in touching turns. Stop ¼ inch behind the eye of the hook and tie off. 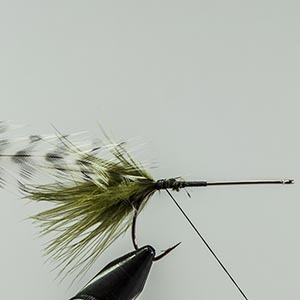 Next, wrap the hackle forward in open non-touching turns. Stop ¼ inch behind the eye of the hook and tie off. Wrap the tying thread to the eye and whip finish. This is essentially a classic wooly bugger. Next, we add the wobble. Step Five: Reattach the tying thread at the tie in point. Step Six: Cut a ¼ inch strip of foam from a 6 mm thick sheet. Use razor blade and cut off the tip of one end at a 45 degree angle. Use a bodkin and make a hole in the center of the strip about 3/8 inch from the tip. Place a drop of super glue on the thread head of the fly, and insert the eye of the hook through the hole. Step Seven: Fold the strip of foam back over the tail and tie down. Whip finish and apply a drop of super glue if desired. Trim the foam off just behind the bend of the hook. Step Eight: Finally, add 3 mm doll eyes using super glue to complete the fly. You can download a printer friendly copy of these instructions in PDF format here. You must have adobe acrobat to open the file. You can watch me tie this fly here. Copyright BugCrafters.com 2011. All trademarks are the property of their respective owners.